Emma King here, Welcome to my ramblings; yes I have decided to write a Blog. Why? Well…as many of you will know I am a puppeteer and have been exploring the world of puppetry for a couple of years now, and as of 9th of January 2017 I have moved across the country to explore more. I am lucky enough to be attending the Curious School of Puppetry. 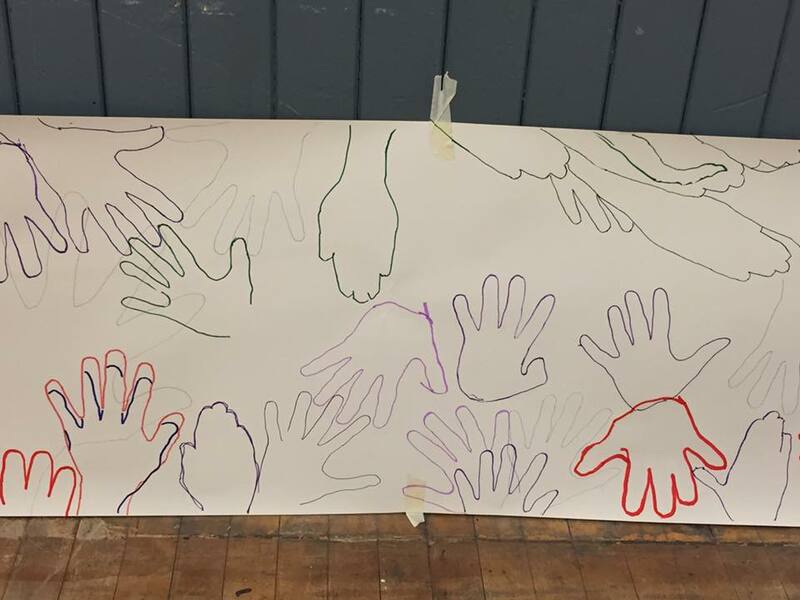 The course is designed to bring Puppeteers, Artists, Theatre Makers, Animators, Musicians, Actors, Dancers and the like together, to develop our puppetry and making skills allowing us to work together and create connections with those on the course and others we meet on our journey together. So here I intend to share some of my experiences of the course. At this point I must thank Creative Scotland and Puppet Animation Scotland for all their support in helping me get here. Our space; Today was our first day at School. Our school, our space, a nurturing environment where we will work together. We are responsible for it. Our Body; we explore tension, and finding our tendencies, finding ways to reset our body. Now I must confess; I’ve done this workshop with Rene Baker before in 2013 at the Manipulate Festival. It’s actually the reason I started seriously exploring puppetry and I’ve called myself a puppeteer ever since. Today we explored using puppets with neutral puppeteer; we found things that the puppet likes to do. The first puppet I used was a little rag doll with a really floppy neck and rattle inside. I found the exercise quite difficult, and I wasn’t receptive enough, was thinking too much about the exercise. 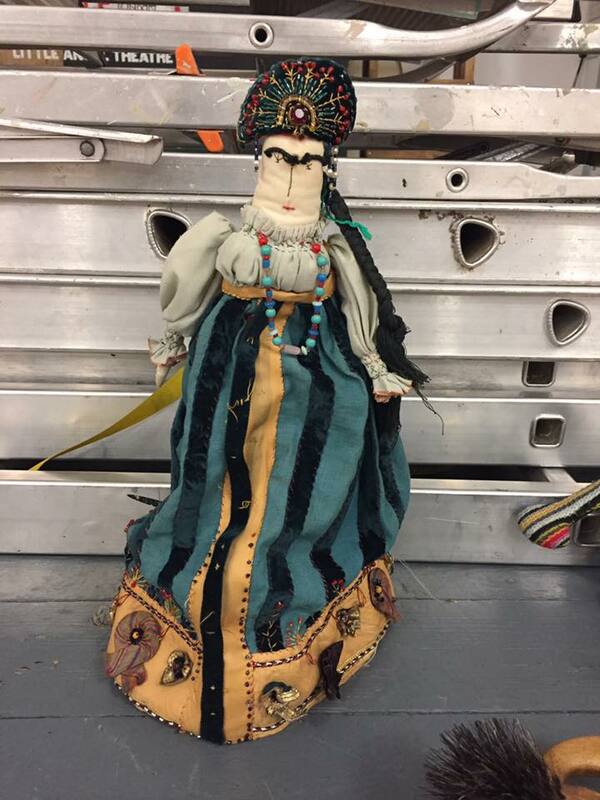 We then moved on to a second; I used was a larger soft puppet with a headdress and dangly beads, it was easier to find what she liked to do( jingling her beads being one) but I still wasn’t satisfied with the connection I was having with the puppets. During lunch I spent some time with the ragdoll, and just allowed myself time to explore her movement; throwing her about and picking her up from different places. After lunch we got into two rows facing each other and Rene talked us through playing with the puppet and finding what it likes to do, we passed our puppets around watched others manipulate them. Then we were asked to find 4 things the puppet liked to do and present them. This time it felt much freer; Rag doll and I performed our moves (she likes to roll). My neutral puppeteer volume was at a 2 which was good, and through chatting with the group about the dolls floppy neck I found a solution to it, using my thumb to support her and just changing my grip a little. Day 3: Shifting focus: Modes Debate and the Talking suitcase. We looked at performance modes today; Actor, Performer, Puppeteer and discussing what each mode is and how it can be used in a performance. Actor mode is an active character with the focus. Puppeteer mode is where the puppet is the character and takes the focus. The Performer mode is a little more abstract; they facilitate objects but are not puppeteers (the object has no character), they are present and in focus but the focus can change. They are not actors because they are not a character but they can represent abstract ideas and environments, they can be a chorus. I know some Performers who don’t like there title as performer being used like this, but the word performer is used to describe the other mode (not actor/not puppeteer). It is difficult to find another word to describe it. Whilst trying out the modes and moving objects in the space, I noticed this suitcase which had been having a lot of objects placed on it, but no one was really engaging with it as anything other than a place to put things. I began to really hope that during a puppeteer mode someone would bring the suitcase to life and shake all the stuff off it. 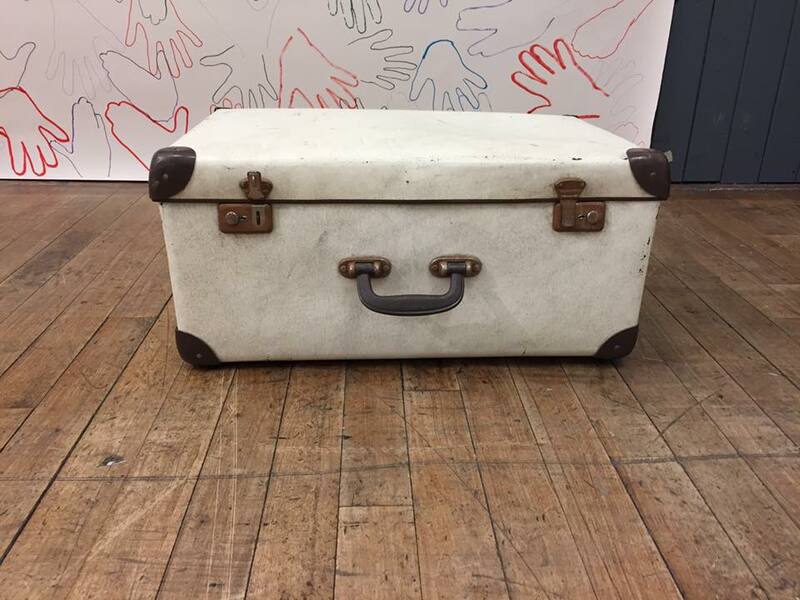 So when presented with the task of using objects and the modes I immediately suggested the suitcase, (it had been talking to me, I know that sounds mad). From there our process felt very fluid, we discussed the suitcase and how we could use it and bring it into focus, we used the performer mode to create an environment with a single actor entering on a different rhythm and showing a connection to the suitcase, leaving the suitcase whilst a single performers mode changed from performer to actor and another’s from performer to puppeteer, then we created this interaction between the suitcase and the actor. All the modes worked and it made sense theatrically why we had used them. The suitcase is abandoned by its owner, in a busy environment (like a train station), a man finds it. The suitcase is defensive and won’t let the man open it, and then after the man gives up on the suitcase it relents and flirts with him and lets him reach inside, the suitcase gives the man a flower, their new relationship begins. Day4: Shifting Focus: One with the puppet. 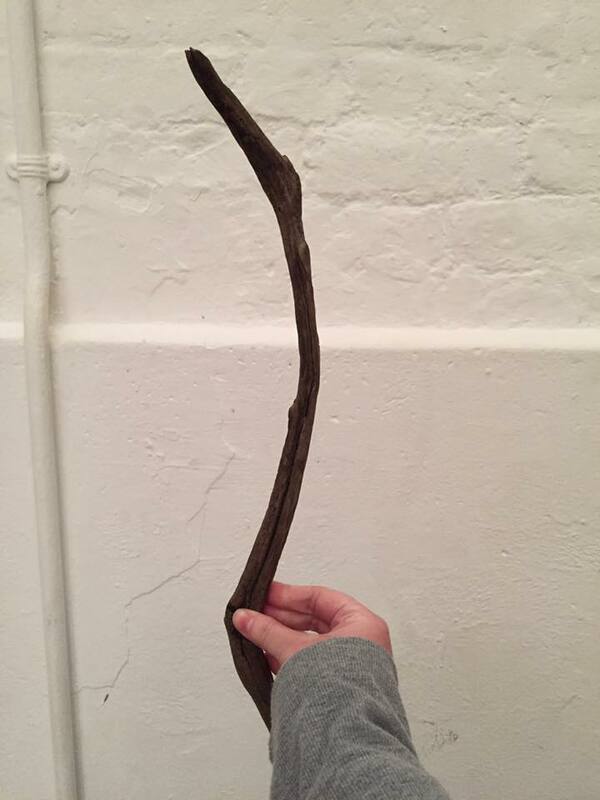 We were asked to create a performance using a puppet or a stick and this idea of both together. During the workshop we had been working a lot with sticks as puppets and I held onto my stick because I was unsure whether I wanted to use a puppet or a stick (I really liked the stick, we worked well together) but I had a look at the puppets and there was this lovely skeletal crow/Dinosaur which had a mechanism in his head which allowed you to open and close his mouth and the stick fitted perfectly in the mouth and he could hold on to it (this was a very satisfying find). I named the puppet Rex and we had a bit of a fight on stage; because he tried to bite me, and we had already discussed (Offstage) that if he behaved he would get a stick. We Met Lyndie Wright who will be teaching us construction, today was all about heads. 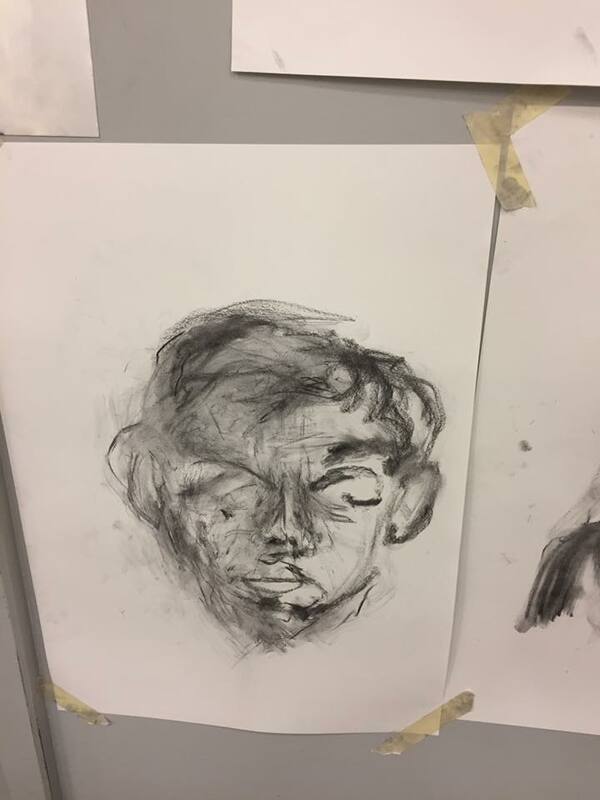 We did some free drawing using crushed charcoal and both hands to draw the person across from you whilst not looking down at the paper. This was a liberating and terrifying experience because you want what you make to be good, but you have no idea what marks you are making. I took this free liberated sensation with me into the next exercise where we were to quarter a page and scribble in each quarter, then find the shapes of heads in it, for two of the quarters I scribbled with my right hand (dominant hand) and two I used my left, and found that my left hand scribbles where much more interesting and I could find much more interesting heads in it. It reminded me that as artists we need to be free and not just follow our tendencies. From the Scribbles Heads we made yesterday, we chose one and made a profile of it, we transferred it onto two pieces of foam block. Those were cut over night and this morning we arrived to the beginnings of a puppet head. We cut out space for a rod, stuck the two pieces of foam together and using the drawings as reference we began carving. 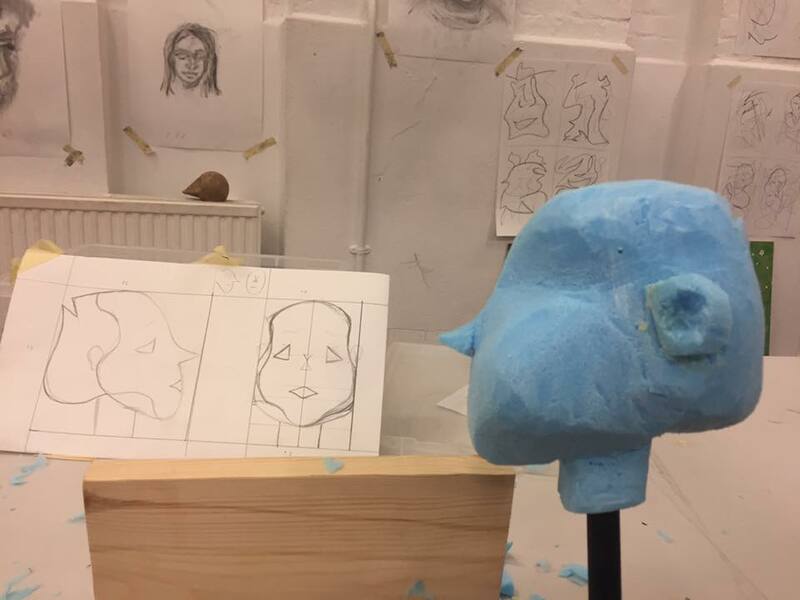 I found myself using the charcoal face technique from yesterday to feel the puppets face as I got further into the carving; I found it helped me visualise where the cheek bones were etc. Then Tim who was helping us with construction said “imagine it from above” think how the shape of the head would be from looking down on it. That absolutely made sense and was a total Ding moment where I saw how the whole head would look and it made me work a lot quicker, I am very happy with the end result.